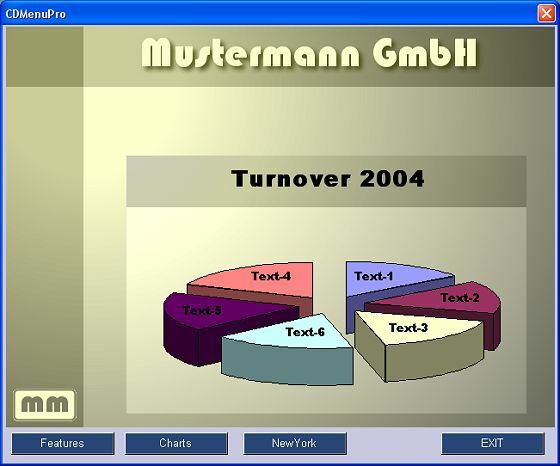 Presentations created using IntroCreator can be embedded into the menu window or linked to a button and played in the intro player. An embedded intro presentation serves in bringing a menu page to life with animated text and images. This means that you have the opportunity to offer more information and make it more attractive to the menu user, creating more interest and a desire for "more". The IntroCreator is a separate software application and is not included in the CDMenuPro software package. Nevertheless, CDMenuPro and IntroCreator can be purchased together in a bundle at a saving. If you have not yet installed the IntroCreator on your system, download the software from the internet or install it straight from the CD if you happen to have purchased the CD version of CDMenuPro. The demo versions are contained in a zip file, unzip these demos into any temporary folder. The size of the intro presentation is 638 x 466 pixels. To make sure there is enough room on the menu page, the size of the menu page should be at least 650 x 510 pixels. You might have to increase the size of the menu page (menu-bar: "Properties - size, position...") Move existing objects on the menu page to create a free space of at least 638 x 466 pixels. The size of the intro area in the menu window can also be reduced. If you do this, however, there will be a fall in quality. Wherever possible you should use the original size of the intro. In the area marked "Intro Player" click on "Play intro presentation in an intro player that is embedded into the menu window"
In the "Embedded Player Window" area, you need to specify the top left hand corner of the Player. Enter a clear and descriptive name for the intro into the field marked "Presentation" and enter the intro file (*.itr) with the help of the "Browse..." button. Close the dialog window with "Ok". You have the option of linking a number of different intro presentations to the embedded player. Insert a button into the menu window. Select the following from list of functions: "Play intro presentation in embedded intro player." The following example demonstrates how all three intro presentations from the "itr_demo_files.zip" download file are linked to an embedded intro player. Playing a non-compiled intro presentation in the external Intro Player. Select the following from CDMenuPro's menu bar: "Objects - Insert intro presentation..." The dialog window displayed in the image above is opened. In the area marked "Intro Player" click on "Play intro presentation in an external intro player"
Playing a compiled intro presentation in the external Intro Player. It's a good idea to compile the presentation. Doing this inserts the presentation into the Player application. Click on the "Link" tab. Click on the "Browse..." button to the right of the "Application" field and enter the compiled player file. An intro presentation can be played first before the actual menu window opens. You will find more details about this on the following page: Menu start / start events. If you decide to embed an intro presentation into a menu window, it is essential that no other menu objects (buttons, text objects, list box,...) are present in the intro area. Wherever possible do not change the original size of the intro when embedding an intro presentation into a menu window. Reducing the size of the embedded presentation will affect its quality. If a background sound file is used for the intro presentation, you need to copy the sound file into the folder containing the .itr file or the .exe file for compiled presentations.